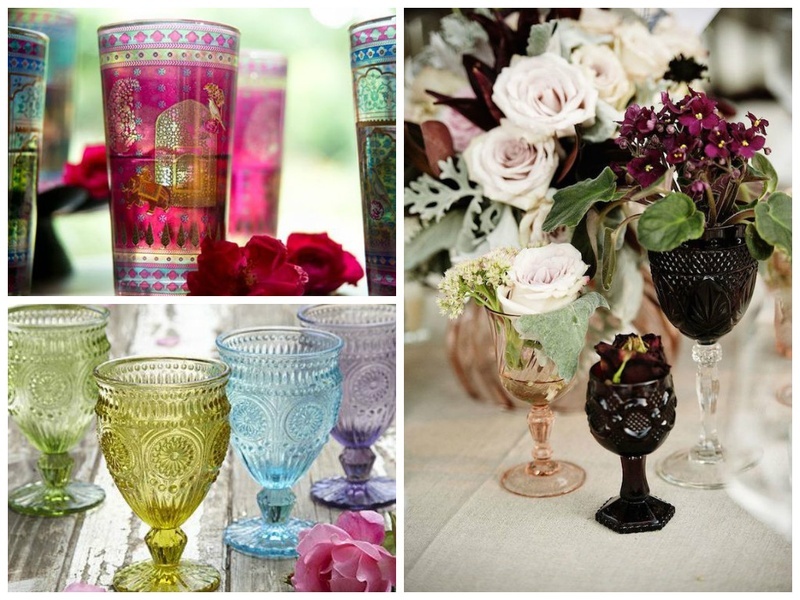 Our brand new obsession this week in wedding decoration is coloured glassware! These oh-so-pretty and beautiful accompaniments of wedding table decorations are an ingenious way to inject lovely bursts of colour into your wedding. With much effort put into your bridal lehenga shopping, photography and entertainment, not much thought is given to cutlery, plates and table setting on a whole. For couples who’re giving this no-brainer detail a creative bend, incorporating coloured glassware to your wedding table settings is a fabulous way of making your Indian wedding decorations more colourful. Whether it’s a vintage or bohemian wedding you wish to have, a cool beach themed celebration or a hopelessly romantic one, these coloured drinking glasses will need the much need glint and shine to your party. Use them for table settings, as props for wedding decor, even as pretty and colorful wedding favours to your guests. We’re swooning over these coloured glasses and we are sure you will too.! Look, look! These absolutely gorgeous glasses can be used to serve sweet beverages or as twinkling tea lights, either way they’re indeed a boon to Indian wedding decorations.